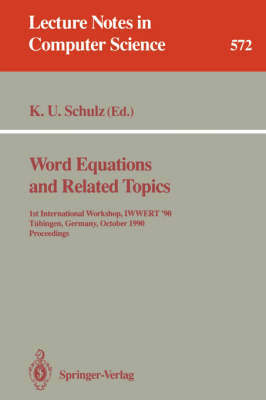 This volume contains papers presented at the first international workshop onword equations and related topics held at the University of T}bingen in October 1990. Word equations, the central topic of this annual workshop, lieat the intersection of several important areas of computer science, suchas unification theory, combinatorics on words, list processing, and constraint logic programming. The workshop is a forum where researchers fromthese different domains may present and discuss results and ideas, thereby supporting interaction and cross-fertilization between theoretical questions and practical applications. The volume collects papers which: - contain new and relevant results, - describe a new approach to a subject, or - give a survey of main developments in an area. Papers cover investigations on free groups, associative unification and Makanin's algorithm to decide the solvability of equations in free semigroups, general unification theory and its relationship to algebra and model theory, Thue systems, and finitely presented groups.